AUGUSTA, Maine — In perhaps a sign of the times, the “Open for Business” highway sign that symbolized the LePage administration’s pro-business agenda may have become a casualty of Maine’s increasingly caustic political atmosphere. The blue highway sign that Gov. Paul LePage ceremonially placed on Interstate 95in Kittery, just inside the Maine’s border, disappeared sometime during the past week. And the Maine Department of Transportation has no idea where it went. The theft first was reported Wednesday by WCSH-6 in Portland. In fact, DOT staff were unaware of the sign’s disappearance until contacted by journalists from the television station inquiring whether the department had taken it down. The oversized sign was presented to LePage on the night of his inauguration as a gift from supporters inspired by his campaign pledge to erect an “Open for Business” sign on I-95 if elected to the Blaine House. A group of supporters raised an estimated $1,300 to purchase the sign from a company that makes highway placards. But the sign also has become a symbol for LePage’s critics of what they say is an administration intent on rolling back widely supported environmental and labor regulations. Click for the rest of the story by Kevin Miller in the Bangor Daily News. AUGUSTA – Most Maine voters think the national media attention that Gov. Paul LePage has drawn in his first four months in office has been bad for the state – including many people who support the work he has done. And most believe he made the wrong decision in taking down a mural depicting Maine workers in the headquarters of the Department of Labor. That’s according to a poll commissioned by MaineToday Media to assess how Mainers feel about the job the Republican governor has done since his inauguration on Jan. 5. LePage was elected in November with about 38 percent of the vote. The poll was conducted from April 25 to May 2 by Pan Atlantic SMS Group, a Portland-based firm owned by Patrick and Victoria Murphy. Victoria Murphy is a former Maine Democratic Party chair. The firm does independent marketing and research. About 56 percent of the respondents said they have an unfavorable opinion of LePage; about 39 percent said they have a favorable opinion of him. About 5 percent said they do not know. Click for the rest of the story by Rebekah Metzler in The Maine Sunday Telegram. When Ed Koch was mayor of New York, he used to walk around the city asking constituents: “How’m I doin’?” We haven’t heard Gov. LePage ask that question in Maine, but we’ve decided to answer it anyway. When more than half the people who look to the governor for leadership don’t like what they see, it’s hard to avoid the conclusion that he’s doing something wrong. Click for the rest of the editorial in The Maine Sunday Telegram. “Governor Announces Staff Changes,” proclaimed the headline over the news release from what’s left of Gov. Paul LePage’s communications office. Wednesday’s sudden departures of commissioners Darryl Brown from the Department of Environmental Protection and Philip Congdon from the Department of Economic and Community Development confirm what many have long feared since Team LePage rode into Augusta promising to transform Maine state government into something . . . well, different. They’ve done it: After just under four months, the executive branch is now officially a three-ring circus. In one ring we have Brown, who was forced to step down after Attorney General William Schneider informed him that those pesky environmentalists were right all along: Conflict-of-interest laws prohibit Brown, who owns a development consulting firm, from presiding over the DEP. For weeks, Brown insisted that he was not in violation of identical federal and state statutes — which made him ineligible to serve if 10 percent or more of his income in the last two years came from applicants for and holders of federal clean water permits. He was, as he conceded Wednesday, “obviously” wrong. That’s not respect for the law, folks. That’s clown talk. Click for the rest of the column by Bill Nemitz in the Portland Press Herald. US Labor Dept. tells LePage: Display mural or refund money | The Portland Press Herald / Maine Sunday Telegram. Governor: Mural was removed at a bad time | The Portland Press Herald / Maine Sunday Telegram. AUGUSTA, Maine — A handful of Maine Senate Republicans are publicly criticizing Gov. 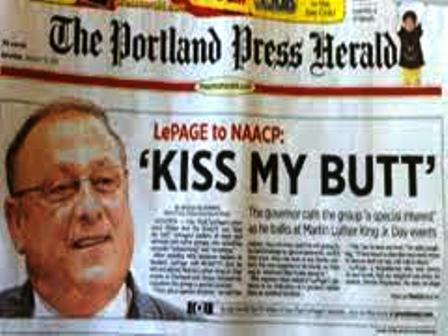 Paul LePage for his frequent controversial comments and actions. An OpEd column written and signed by at least eight Maine GOP senators, which will be published Monday in some Maine newspapers, indicates growing displeasure with LePage’s conduct. The Republican senators further criticize LePage for demeaning others who disagree with him and diverting attention from real issues. Click here for the rest of the story by Eric Russell in the Bangor Daily News. Here are a few links to stories about LePage’s mucked-up walk through Maine politics.